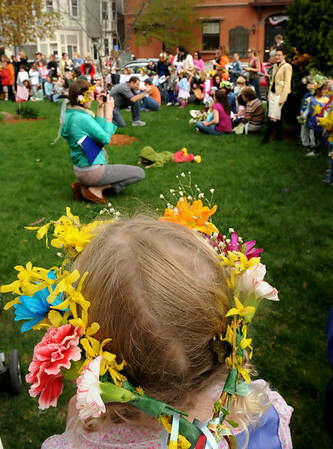 Newburyport: Young heads were covered with spring flowers at the Newburyport Montessori School did their annual celebration of May Day starting in Brown Square. They then headed into upstairs at city hall as the strong winds and rain threatened. Bryan Eaton/Staff Photo Newburyport News Friday May 1, 2009.